Washington - President Barack Obama's special envoy to Sudan says there is no evidence to back up the US designation of Sudan as a state sponsor of terrorism. Scott Gration told lawmakers on Thursday at a hearing that US sanctions linked to that designation hurt the work he and others are trying to do to rebuild and help people suffering in the war-torn country. Gration bluntly called the sanctions a "political decision" and said that at some point the US was going to have to "unwind" them. Gration says that the Khartoum government has been helpful in stopping the flow of weapons and in dealing with key members of the terror group al-Qaeda. Democratic Senator Russ Feingold disagreed, saying statements of Sudan's co-operation are "overstated." Read report from website of United States Senate (Washington, DC) - via AllAfrica - Sudan: Testimony of Special Envoy Scott Gration for Hearing on Sudan, 30 July 2009. Chairman Kerry, Ranking Member Lugar, Members of the Senate Foreign Relations Committee, thank you for the opportunity to be here today to discuss our strategic objectives in Sudan and to outline what we are doing to make them a reality. Mr. Chairman, let me begin by acknowledging your leadership on these issues. We greatly appreciate your commitment to finding solutions to the many challenges confronting the people of Sudan. That commitment is widely shared by the members of this committee, including Senator Feingold, Chairman of the Africa Subcommittee, with whom I have recently met, and Senator Isakson, Ranking Member of the Subcommittee. We are especially grateful to you, Mr. Chairman, and Senators Corker and Isakson for participating in the State Department’s Forum for Supporters of the Comprehensive Peace Agreement (CPA) which we held here in Washington last month. I will say more about those proceedings in a few moments, but I want to thank you now for your support. The great human tragedies that have occurred in Darfur and the rest of Sudan are deeply embedded in our memories. Many people in Sudan suffer terribly from the pain and loss brought by conflict, and it is these people who deserve our support. We have made progress in recent months, but we have much work ahead. From my visits to Sudan, the region, and throughout the international community, I have found the challenges in Sudan to be complex and our timeline compressed. Because of the complicated nature and urgency of the tasks at hand, we have helped to craft a strategic approach that blends all elements on national power and a methodology that is integrated, comprehensive, and based on a policy of dialogue and engagement. I want to take a moment to discuss our engagement. Engagement is not something we pursue for its own sake, and it is not about accommodating the status quo. Engagement does not mean the absence of pressure, or doling out incentives based on wishful thinking. On the contrary, it is about working to change conditions on the ground. Engagement means frank dialogue about what needs to be accomplished in the months ahead, how we can help make those accomplishments happen, how the bilateral relationship could improve if conditions on the ground transform, how the Government of Sudan could become even more isolated if it does not act now, and how we ensure that all parties are held accountable. First let me tell you what we want to achieve. We want a country that is governed responsibly, justly, and democratically, a country that is at peace with itself and with its neighbors, that is economically viable, and a country that works together with the United States on common interests. We want an inclusive and durable peace in Darfur. We want full implementation of the Comprehensive Peace Agreement and a peaceful post-referendum period whether as a single, stable, and unified Sudan or a Sudan that divides peacefully and orderly into two separate states. We want only what is best for the Sudanese people. This is our vision. Now let me tell you how we’re going to make it a reality. We are using diplomacy, defense, and development—all the elements of national power—to achieve our strategic objectives. We are engaging directly with all of the relevant parties inside Sudan to bring peace and stability to the country. This includes the two main parties of the Government of National Unity (GNU)—the National Congress Party (NCP) and the Sudan Peoples’ Liberation Movement (SPLM), as well as other political parties and movements and civil society. We have traveled to the country three times since my appointment in March, and returned just a few days ago from our last trip. We were in Khartoum to facilitate trilateral talks to advance timely implementation of the CPA and in Darfur to review our progress on facilitating humanitarian assistance and to promote the Doha peace process. I visited several camps for internally displaced persons, met with camp leaders, and saw firsthand the day-to-day struggles these Darfuris must face. Ultimately, the Government of Sudan must be accountable to its people and bear responsibility for peace within Sudan’s borders. To achieve our goals, we must also engage with Sudan’s neighbors and the international community. This is why we have traveled around the world to Chad, China, Egypt, France, Libya, Norway, Qatar, and the United Kingdom to meet with key leaders who share our common concern and want to work together toward shared objectives. This is why, at the end of June, we convened the Forum for Supporters of the CPA here in Washington to bring together representatives from over 30 countries and international organizations to renew the global commitment to seeing a peaceful and stable Sudan. We are confident that this multilateral group will work closely together to achieve a lasting peace in Sudan by keeping Sudanese parties positively engaged in implementing the peace agreement and preparing for the future, increasing the capacity of the Government of Southern Sudan, and helping to keep all Sudanese government institutions accountable to their people. We are dedicated to carrying this vision to success. I have built a team of sharp and dedicated individuals who, along with our colleagues based in Sudan, are working tirelessly to achieve our objectives. My role is to guide our vision, and I will do all that is in my power to see this vision come to fruition. I report regularly to President Obama and Secretary Clinton about our progress and have visited Congress to exchange views with you and a number of your colleagues. I look forward to speaking with many more of you in the weeks ahead. We are committed to working together as a strong and united team to achieve our objectives of a politically stable, physically secure, economically viable, and peaceful Sudan. Now let me tell you more about the four pillars required to support this vision of Sudan. Most urgently, we want a definitive end to conflict and gross human rights abuses in Darfur and justice for its many victims. We can never forget the lives needlessly lost in the last five years, and the millions who continue to be displaced. As I witnessed last week, families still crowd into makeshift housing in IDP camps, women continue to gather firewood in fear, and children grow up without hope for a better tomorrow. To resolve this humanitarian tragedy, we believe only a negotiated political settlement between the government of Sudan and all parties to the conflict will bring sustainable peace to Darfur. Our goal is to conclude an agreement that will allow people to go back to their home villages or a place of their choosing to resume their lives in safety, stability, self-sufficiency, and security. Past peace negotiations have faltered, and we have learned from these experiences. We are collaborating with the African Union and United Nations joint chief mediator, Djibrill Bassolé, to ensure that the peace process is inclusive and that it adequately addresses the grievances of the people of Darfur. We are engaging with the fragmented movements in Darfur to help them unite and to bring them to the peace table with one voice. We are working with Libya and Egypt to end the proxy war between Chad and Sudan that has ignited further conflict. We are supporting the full deployment of the African Union-United Nations Mission in Darfur (UNAMID) as a critical mechanism for protecting Darfuri civilians. We are determined to work toward a peaceful Darfur where displaced families can resettle and reestablish their homes. We must act without delay—innocent Darfuris have suffered for too long. Our second pillar focuses on sustaining peace between the North and the South. In January 2005, the Government of Sudan and the Sudan People’s Liberation Movement signed the Comprehensive Peace Agreement, ending a 22-year war. Four and a half years after the signing of the CPA, peace remains fragile. In just eight months, Sudan will hold national elections in April 2010 and referenda in Southern Sudan and the Abyei region beginning nine months later in January 2011. Our timeline is so very short; it is urgent that we act now to support the full implementation of the CPA. This will not be easy. 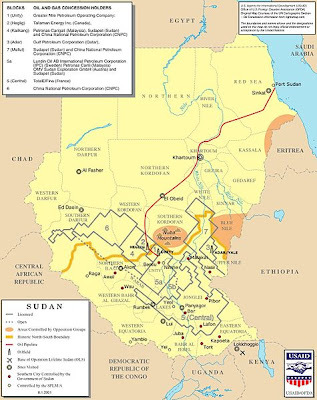 Just over a week ago, the Permanent Court of Arbitration in The Hague announced its arbitration decision on the Abyei border delineation—a highly sensitive and emotional issue for both parties to the CPA. Before the boundary decision was handed down, we spent a significant amount of time with the parties, working to ensure the decision would be accepted and fully implemented. Tensions in Abyei remain high and the international community must continue to be vigilant. As we have seen before in that area, tensions between the Ngok Dinka and Misseriya can quickly erupt into violence, resulting in a conflict that could bring the SPLM and NCP into direct confrontation and threaten to derail the CPA. We will also need to continue support for the UN Mission in Sudan, help the parties prepare for elections in April, and ensure legitimate popular consultations in Southern Kordofan and Blue Nile states. Collectively, we must assist the parties as they prepare for the January 2011 referenda and their consequences. These are just a few of the major challenges ahead as we help the parties implement the remaining milestones in the CPA. It is critical that we work with the parties to begin the process of democratic transformation and decentralization, so that in January 2011, the voices of the people of Southern Sudan will be heard and we can witness a unified and peaceful Sudan or a Sudan that is on an orderly path toward becoming two separate and viable states at peace with each other. Resolving the issues of North and South is critical to tackling challenges in Darfur and other parts of the country. These twin challenges must be addressed with equal attention and vigor. The third pillar calls for a functioning and stable Sudanese Government, and one that will either include a capable Government of Southern Sudan or coexistpeacefully with an independent southern Sudan. Our strategy seeks to help the South improve its security capacity to defend against external and internal threats while striving to ensure a potentially independent Southern Sudan is politically and economically viable. Our fourth and final pillar is to seek increased and enhanced cooperation with the Sudanese government to counter terrorism and to promote regional security, consistent with—and not at the expense of—our overall objectives of peace and security in Sudan. We also seek an end to Sudan’s efforts to weaken or marginalize opponents abroad or align with negative state and non-state actors. Our whole-of-government approach is integrated and comprehensive. It is firmly founded in the belief that engagement with all of Sudan, the region, the international community, and civil society is essential if we are to secure our vision of a Sudan that is ruled more justly and democratically, is at peace with itself and with its neighbors, is economically viable, and works together with the United States on our shared interests. 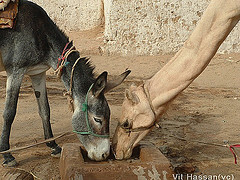 Further, our strategy is deeply rooted in a conviction that we must do all we can to end the human suffering in Sudan. As you can see, we are aiming high, thinking big, and expecting much. We do so because we believe innovative concepts and ideas, coupled with detailed planning and sufficient resources, are the only way to achieve big results. Big results are exactly what we need in Sudan at this critical moment. Mr. Chairman and Members of the Committee, I would like to thank you for your leadership and support on efforts to end the suffering in Darfur and the rest of Sudan. Again, thank you for allowing me to be here today to discuss these issues that are so important to us all, and especially to the Sudanese people. Click on Gration label here below to see related reports and latest updates. Further to yesterday's blog post here at Sudan Watch [Wednesday, July 29, 2009: Shocking photo of Lubna Ahmed Hussein wearing "indecent" trousers in Sudan] I have today added my name to the 1,117 fans at Lubna Hussein's Facebook page. Here's hoping people will help generate publicity for Sudanese journalist Lubna Ahmed Hussein in support of her courageous attempt to change a dress code law in Sudan that recently resulted in 10 women in Sudan being lashed for wearing trousers. If Ms Hussein is found guilty of wearing trousers (considered as "indecent" clothing) she faces the prospect of 40 lashings. Further details here below. Suggest to Friends, View Updates, Subscribe via SMS. Lubna Ahmed Hussein, a well known Female Journalist in Sudan. She writes a regular column "Men Talk" in Alsahafa newspaper, one of most popular Arabic daily newspaper, and founded by her late husband Abdul Rahman Mukhtar. In her column she criticizes courageously the situations in Sudan as well as the orientations of the Sudanese sitting government and the militant fanatic Islamists alike. "My Clothes when the Public Order Police Arrest me" by Lubna Ahmed Hussein. Photo: "I was wearing this clothes when he Public Order Police Arrest me and accused me as "dressed, contrary to public sense". (Khartoum) – Following the arrest of a female journalist by the public order police in Khartoum, a number of prominent politicians and lawyers are calling for a revision of the Public Order Act. The journalist, Lubna Ahmed Hussein, was detained by the authorities because she was wearing trousers. Sudan Radio Service spoke to some of the politicians and lawmakers who came to the Khartoum court on Monday out of solidarity with the accused journalist. The SPLM deputy secretary-general, Yasir Arman, described the public order law as a violation of the interim constitution. The leader of the opposition Umma National party, Dr. Mariyam al-Sadiq al-Mahdi, said that the law discriminates against women. The leader of the Democratic Force Movement, Hala Mohamed Abdulhalim, also spoke to Sudan Radio Service. Hala Mohammed Abdulhalim was speaking to Sudan Radio Service from Khartoum. Click on label here below - Sudan women 'lashed for trousers' - to see related reports and latest updates. Thanks to CNN for linking to Sudan Watch. See CNN's video report published today. In the news today (see here below) the BBC's James Copnall in Khartoum (click here to see his video report) says Sudanese journalist Lubna Ahmed Hussein, who works for UN mission in Sudan and faces the prospect of 40 lashings if found guilty for wearing "indecent" clothing (see photo here below), is determined to generate as much publicity as she can in an attempt to get the law changed. So, further to Sudan Watch, July 13, 2009 Sudan women 'lashed for trousers', here is my contribution, with best wishes and good luck to Ms Hussein in her courageous stance. I think lashing is physical and mental torture and that any type of cruelty is unlawful. Men in Sudan are free to wear gowns, dresses, skirts, trousers. Women should have equal rights and not be punished for wearing trousers. Here is a shocking photo of Lubna Ahmed Hussein wearing "indecent" trousers in Sudan. If it's against the law I wonder why they were wearing trousers? Not that I would ever condone women being lashed, I hasten to add. Totally babaric. If you want to live in North Sudan you must adhere to its Islamic principles and most of all its Islamic Sharia law. If you do not like this then move to the Secular southern Sudan. Sudan is not the West and there should not be this arrogant hegemony that whatever the West does it right and whatever the East does is wrong. Western civilization has massacred tens of millions with its blind arrogance. People fully know the law, if you do not dress modestly according to Sudanese standards there will be consequences, it's silly to commit a crime and pretend like you're the victim. Lubna Ahmed Hussein (or Al-Hussein) is a well known female journalist living in Sudan. She writes a regular column entitled "Men Talk" in "Al-Sahafa" (i.e. “The Press”), one of most popular Arabic daily newspaper, and founded by her late husband Abdul Rahman Mukhtar in 1961. In her column she criticizes courageously the situations in Sudan as well as the orientations of the Sudanese sitting government and the militant fanatic Islamists alike. Today, on July 29th, 2009, Lubna will face 40 lashes because she was wearing trousers. She and twelve other women wearing trousers were recently arrested in a restaurant in the capital, Khartoum. Ten of the women had pleaded guilty to the charges and had 10 lashes immediately even if several of them were from the mainly Christian and animist south, and in Sudan non-Muslims are not supposed to be subject to Islamic law, even in Khartoum and other parts of the mainly Muslim north. In spite of that, Lubna was condemned to 40 lashes and to a 250 Sudanese pounds fine (about 74 euro). So, she posted the invitation to her friends and supporters to «stir up a scandal around her case». She said that «this is not a matter of a personal attack against me as a journalist, nor of preserving my personal dignity. Far from it … The issue has taken on a different character, [and I call] on the public to be [my] witness and [to judge for themselves whether this incident] is a disgrace for me or for the public order police. You will decide after hearing the charges and the prosecution witnesses, rather than [only] my side of the story». This is a fact, but there is something worst about this story. If you search for Google about Lubna corporal punishment, you will soon realize that a deafening silence is fallen on this event by most women who has power in the world. Female politicians, entrepreneurs, journalists, professionals seem to ignore such a cruel sentence. No struggles, no demonstrations, no public declarations. Apart some comment on Facebook and some other social network, few blogs, and some on-line newspaper, the women universe is incredibly quiet about Lubna's fate. I am astonished, surprised, angry about that. Where are the rich and powerful women who always speak of equal opportunities and rights of women? Where are the politicians, the feminists, the female bloggers? I do not understand and, as a man, I feel ashamed for them too. The decision of a Sudanese judge in charge of Lubna Ahmed Hussein’s trial has postponed his decision to August 4th. It seems that Lubna refused to use her UN immunity in the trial, which she could have done, to save herself the lash. So, women: you have a second chance to voice your disagreement and your protest. Please, use it! The trial of a Sudanese woman charged with wearing "indecent" clothing has been adjourned, but will continue after she decided to waive her immunity. A Khartoum judge told Lubna Ahmed Hussein she could have immunity because she works for the UN. But Ms Hussein, who claims she was arrested for wearing trousers, said she wanted carry on with the trial because she wanted to get the law changed. Under Sudanese law she could face 40 lashes if she is found guilty. "I wish to resign from the UN, I wish this court case to continue," she told a packed courtroom. The woman - a journalist who works for the UN mission in Sudan - had invited journalists and observers to the trial. She was arrested in a restaurant in the capital with other women earlier this month for wearing "indecent" clothing. She said 10 of the women arrested with her, including non-Muslims, each received 10 lashes and a fine. "I want to change this law, because hitting is not human, and also it does not match with Sharia law," she told the BBC. The BBC's James Copnall in Khartoum says Ms Hussein is determined to generate as much publicity as she can. Meanwhile another female journalist who wrote an article supporting Ms Hussein has been charged with defaming the police, which can carry a hefty fine. Amal Habbani wrote an article for Ajrass Al-Horreya newspaper following the arrests entitled "Lubna, a case of subduing a woman's body". (Khartoum) – The first hearing session in the case of the journalist who was accused of dressing indecently early this month has been ajourned. Lubna Hussein, who works in the office of the UNMIS spokesperson in Khartoum, was arrested by the public order police, together with other 8 women. They were arrested on a charge of wearing provocative clothing. Sudan Radio Service spoke to Lubna Hussein’s defence lawyer, Nabil Adib, immediately after the session. Adib said that his client had insisted on waiving her immunity so that she could face prosecution. Nabil Adib was speaking to Sudan Radio Service in Khartoum on Wednesday. * Do these women know that Sudanese law prohibited wearing troussers? * If the answer is yes. Does the law of Sudan says that they should be lashed? Does this apply for the other 29 women? Probably 30 women have the same ideas or political thoughts, which aren't compatibility with government. Repressive regimes always find religious excuse to cover their pressure on press freedoms. Nothing in Islamic laws like this punishment but its just in Taliban's Islam there is like that law. I understood this article so that the women are lashed because they wear trousers. I myself wear trousers because it's comfortable. On the other hand why should always the men dictate which dressing is "indecently" and which not. Why do men think that women want just to seduce men? Aren't the women able to decide for themselves what's bad moral and what's not? I am so sorry that the men still dictate what the women have to do and what not. This article grabed my attention. I have no idea whether they know it or no. Nevertheles it is discriminating women. That's barbaric. In other countries police officers would be suspended and go to jail for doing something like that. This world is really crazy. Woman in court in trouser "test case"
Click on label - Sudan women 'lashed for trousers' - here below for related reports and latest updates. "There will be surveyors: two from the SPLM, two from the National Congress and the Government of National Unity together with international experts. The American government will send its experts and they will go on the ground and survey the area and this will happen in September. A permanent Administration for Abyei area will be formed in order to run the affairs of the Abyei area over the coming eighteen months in order to prepare the people of Abyei for a special referendum in which the people of Abyei will decide whether they belong to Bahr el-Ghazal or to Southern Kordofan." The ruling of the Abyei tribunal in The Hague was only to determine the boundaries of nine Ng’ok Dinka chiefdoms in Abyei and not the south-north boundary. There is already a north-south committee to discuss and to demarcate the north-south border. It’s that body that will determine the boundary of the north-south border. The north-south border committee is expected to present its findings in September this year. (Khartoum) – The Minister of Foreign Affairs, Deng Alor Kual, has confirmed that the demarcation of the Abyei boundary will start in September under the supervision of a panel of international experts. Speaking in Khartoum on Monday, Alor, who is also a member of the Sudan People’s Liberation Movement, said that although the Permanent Court of Arbitration’s ruling was a “win-win” decision, the Dinka Ngok had lost part of their land to the Misseriya Arabs. The SPLM accepted the verdict in order to avert a return to war between southern and northern Sudan. [Deng Alor Kual]: “The court’s decision was a success and the decision has no winner or loser, it is a “win-win” situation. We have lost some parts [of the land] but we are committed to this decision and next September demarcation will take place on the ground in Abyei. There will be surveyors: two from the SPLM, two from the National Congress and the Government of National Unity together with international experts. The American government will send its experts and they will go on the ground and survey the area and this will happen in September”. Alor announced that a permanent Administration for Abyei area will be formed in order to run the affairs of the Abyei area over the coming eighteen months in order to prepare the people of Abyei for a special referendum in which the people of Abyei will decide whether they belong to Bahr el-Ghazal or to Southern Kordofan. Alor declared that the Dinka Ngok will respect the PCA verdict and will allow the Misseriya to cross the Dinka Ngok area, taking their cattle in search of grazing and watering, but they should respect the border. Alor is urging southern Sudanese in northern Sudan to return home before the 2011 referendum. (Juba) – A senior SPLM member says the ruling of the Abyei tribunal in The Hague was only to determine the boundaries of nine Ng’ok Dinka chiefdoms in Abyei and not the south-north boundary. The GOSS Minister for Presidential Affairs, Luka Biong, spoke to Sudan Radio Service by phone from Juba on Tuesday. Biong was in the SPLM delegation that went to The Hague for the announcement of the court. Biong said that the north-south border committee is expected to present its findings in September this year. Biong went on to explain the issue of who will be eligible to vote in referendum for Abyei. Click on Abyei label here below for related reports and latest updates. "As long as Unity state is one of the ten southern states it means that Heglig belongs to the south. The ABC report said Heglig is part of Abyei, the PCA said it is not part of Abyei. The southerners are saying if the PCA has removed Heglig from the Abyei area, it should be part of Unity state. The north is saying no, it should be included in Southern Kordofan state. This is the situation now. 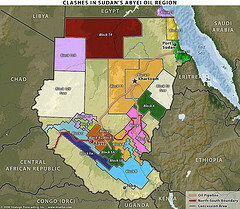 (Khartoum) – Heglig, the biggest oil field in Sudan, could be a source of potential conflict between the SPLM and the NCP, following the verdict by the Permanent Court of Arbitration which has placed Heglig and Bamboo oil fields outside the Abyei boundaries. Sudan Radio Service spoke to political analyst Mahjoub Mohamed Saleh from Khartoum on Monday. Since the two partners have reaffirmed their satisfaction with the PCA’s verdict regarding the Abyei boundaries, Mahjoub explains the source of the disagreements. The SPLM said it is prepared to refer the issue of the Heglig oil fields to the PCA, if necessary. However Mahjoub says that the PCA has already announced its final decision regarding Abyei issue. Mahjoub Mohamed Saleh, a political analyst, was speaking to Sudan Radio Service from Khartoum. Click here to view large version of the following map from Wikipedia. Click, once or twice, on image at Wikipedia to see full screen size. 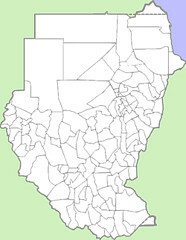 Click here to view Heglig pin pointed on the following map from Wikipedia. Heglig (also spelled Heglieg) is a small town in South Kurdufan state in central Sudan, near the border with Southern Sudan. The area was contested during the Sudanese Civil War. The South Sudanese Sudanese People's Liberation Army (SPLA) rebels attacked the oil rigs of Heglig to damage this important source of revenue for the Sudanese government. Faina cargo: Final destination of the tanks is a compound N.E. of Juba controlled by the military wing of the South Sudan Army? According to the following article by British journalist Fred Bridgland in Johannesburg, the mystery of what happened to 33 Russian-made T-72 combat tanks discovered by Somali pirates aboard a Ukrainian ship they hijacked ten months ago has been solved. I wonder how Mr Bridgland can be so sure. The story has taken so many twists and turns I think he ought to have prefaced the statement 'has been solved' with a few words such as 'it would appear'. "... Since March, however, eyewitness reports, some corroborated by photographic evidence, have placed the tanks elsewhere. At the same time, extensive construction has been ongoing at a military compound of the Sudan People's Liberation Army. Also, note Mr Bridgland states that South Sudan is stockpiling weapons in case civil war reignites. How does he know, I wonder. Considering he is a veteran reporter, I find his irresponsible reporting disgraceful. More on him at the end of this blog post. THE MYSTERY of what happened to 33 Russian-made T-72 combat tanks discovered by Somali pirates aboard a Ukrainian ship they hijacked ten months ago has been solved. The tanks, with enormous fire-power and each weighing 41 tonnes, have begun arriving - in breach of a peace agreement - in the semi-autonomous province of South Sudan, according to Jane's, the world's leading military intelligence publisher. The T-72s aboard the MV Faina were one of three clandestine tank and heavy weapons deliveries to South Sudan accidentally revealed to the world by the pirates. The tanks were being sent to South Sudan in preparation for a new war in case Sudan's 2005 Comprehensive Peace Agreement (CPA) - brokered by Norway, Britain and the US - collapsed. Fortunately, the 110-year-old Permanent Court of Arbitration in The Hague last week reached a decision on the disputed Abyei region which has probably saved the CPA and has paved the way to a referendum on South Sudan's secession and independence from Sudan in 18 months' time. South Sudan is certain to vote for independence from Sudan, Africa's biggest state, setting a precedent in Africa, whose organisations have previously maintained that the continent's post-colonial boundaries are inviolate. The oil-rich and well-watered Abyei region straddles the border between South Sudan and the powerful north, with its capital in Khartoum, and was claimed by both sides. North-South fighting there last year left more than 100 dead and the main town, Abyei, reduced to ashes. It also threatened to trigger again the country's 22-year civil war which was ended by the CPA. It is estimated more than two million people died in the conflict, with four million becoming refugees. The five-judge Permanent Court of Arbitration redrew Abyei's borders and the compromise has been accepted by both the Sudan government in Khartoum and the semi-autonomous South Sudan administration in Juba. In a story worthy of John Le Carré, Jane's, citing satellite and intelligence evidence, traced the circuitous journey of the tanks and other weapons aboard the MV Faina from 25 September last year, the day Somali buccaneers hoisted themselves aboard the ship and the 17-member crew surrendered. The Faina's captain, Vladimir Kolobkov, died of a heart attack soon after the hijack and his captors put his body in the ship's freezer for later return to his family. Once aboard, the pirates discovered that, in addition to the T-72s, there were also six anti-aircraft guns, 150 grenade launchers and thousands of tonnes of small arms and ammunition. The pirates demanded a ransom of US$20 million for the release of the Faina, its crew and cargo, triggering more than three months of negotiations. Finally, with the Faina surrounded by the United States' 5th Fleet and the pirates threatening to blow up the ship unless their demands were met, they settled for $3.2m, paid in dollar bills which were parachuted on to the Faina's deck from a light aircraft. The question was: where would the Faina head next? Its original destination was the Kenyan port of Mombasa. The Kenyan government claimed the Russian tanks were intended for its army, even though its small armed forces were entirely equipped with British and American weaponry. However, Edward Mwangura, head of the Mombasa-based non-profit East African Seafarers' Assistance Programme, which works to free ships held by Somali sea raiders, said he was convinced the tanks were intended for South Sudan. Among his evidence, he said, was the Kenyan government's inability to produce certificates proving ownership of the weaponry. Mwangura was arrested by Kenyan security forces and charged with "making alarming statements to foreign media touching on the security of the country". But Jane's last week confirmed the accuracy of Mwangura's allegation. The popular Seafarers' Assistance chairman, subsequently released from detention, is to be the subject of a Hollywood film with Oscar-nominated actor Samuel L Jackson as Mwangura. Jane's said that once the ransom had been paid the tanks were unloaded in Mombasa and taken to Kahawa army base outside Nairobi. It said satellite imagery surveillance from March onwards showed "a pattern of tanks making their way north" from Nairobi to the South Sudan border. Again via satellite imagery, Jane's identified the final destination of the tanks as a compound northeast of Juba controlled by the military wing of the South Sudan Army. Quoting intelligence reports, Jane's said there had been at least three ship deliveries of tanks, totalling more than T-72s, via Mombasa for South Sudan, the first of which had been in November 2007. The defence publisher concluded: "South Sudan is assembling an armour fleet, preparing for any eventuality in its enduring dispute with Khartoum." While other mysteries surrounding the incident remain, it has been established that the owner of the Faina - which has had at least three previous names and is registered in Belize - is a Ukraine-based Israeli named Vadim Alperin. He has links to Mossad, Israel's national intelligence agency, and Mossad front companies in Kenya. A photograph newly published on a US intelligence website shows Alperin meeting the Faina on arrival in Mombasa in February with the chief of Ukraine's foreign intelligence service, Mykola Malomuzh, by his side. Note that Fred Bridgland saw fit not to name the US intelligence website from which he lifted information for his article. I wonder why hacks are so stingy with giving credit and links to other people's websites and writings. Maybe they think readers are stupid. Some of us can spot their sticky fingers. It has taken me years to understand how news reports on Sudan originate enabling me to notice widespread plagiarism by professional reporters. Here's another thing, who is he to say 'South Sudan is certain to vote for independence from Sudan' without prefacing the line with words such as 'in my view'? More on his dangerous writings in a postscript below. The following photos and captions are from www.militaryphotos.net (12 Feb. 2009) and www.fresh.co.il (13 Feb. 2009). Sorry, name of original source, author of captions, photographer(s) were not published at the websites. Photo: A US Navy helicopter patrols Thursday, Feb. 12, 2009, on the Mombasa coast, Kenya, awaiting for the Ukrainian ship Faina, which is expected to arrive at the Mombasa port Thursday accompanied by a U.S. warship. The seizure of the MV Faina loaded with Soviet-era tanks and other heavy weapons was one of the most brazen acts in a surge of pirate attacks on the shipping off the Somali coast. The ship was held by Somali pirates for more than four months. Photo: A Kenyan navy boat moves towards the MV Faina, a Ukrainian ship carrying 33 Soviet-era T-72 tanks plus other weapons, near the port of Mombasa, 500 km (310 miles) from the capital Nairobi, February 12, 2009. The Ukrainian ship laden with tanks and freed by Somali pirates after a five-month hijack approached port in Kenya on Thursday with debate still ranging over ownership of the sensitive military cargo. Photo: Kenyans look at Ukrainian ship MV Faina, escorted by the Kenyan navy, as it arrives at the port of Mombasa, 500 km (310 miles) from the capital Nairobi, February 12, 2009. The Ukrainian ship laden with tanks and freed by Somali pirates after a five-month hijack approached port in Kenya on Thursday with debate still ranging over ownership of the sensitive military cargo. Photo: Crew members of the Ukrainian ship MV Faina shakes hands on arrival at the Kenyan coastal sea Port of Mombasa, some 500km from Nairobi, February 12, 2009. The Ukrainian ship laden with tanks and freed by Somali pirates after a five month hijack approached port in Kenya on Thursday with debate still ranging over ownership of the sensitive military cargo. Photo: The chief of the Foreign Intelligence Service of Ukraine Mykola Malomuzh, right, with the owner of the ship Faina, Vadim Alperin, left, stand on the dock after the ship docked at the Kenyan port of Mombasa Thursday, Feb.12, 2009. The Ukrainian cargo ship Faina which was hijacked by Somali pirates with its 20-man crew, and carrying tanks and other heavy weapons was released Thursday Feb. 5, 2009, after pirates received an airdropped ransom of $3.2 million. Photo: Crew members of the ship Faina that docked at the Kenyan port of Mombasa Thursday Feb. 12, 2009 stand for a minute silence for the captain of the vessel who died on the ship. The Ukrainian cargo ship Faina which was hijacked by Somali pirates with its 20-man crew, and carrying tanks and other heavy weapons was released Thursday Feb. 5, 2009, after pirates received an airdropped ransom of $3.2 million. EXCLUSIVE - A 50-Page e-book. Fred Bridgland, then a young Reuters correspondent, won his 15 minutes of fame in 1975 when he exclusively revealed the secret South African military invasion of Angola, backed by the CIA, MI6, the French Secret Service and Zambian President Kenneth Kaunda. Bridgland subsequently wrote a highly controversial biography of Jonas Savimbi, leader of an Angolan liberation movement and a friend of Che Guevara. Savimbi’s brilliant young deputy, Tito Chingunji, helped Bridgland research the book and became his closest African friend. But, after the book was published, Savimbi executed Chingunji, his wife and children, parents and his entire extended family. He also threatened Bridgland with death. ColdType’s 50-page essay is a treatment Bridgland has completed as a proposal for new book on his friend Chingunji’s murder and telling the true story of the madness that gripped Savimbi and his guerrilla movement. Click on Faina label here below to view related reports and updates. In a telephone interview from Abyei, Hamdan Ahmad Ali, who identified himself as the "emir of the mujahidin in Al-Misiriyah tribe" said the majority of his tribe which is of Arab origins rejects the PCA's ruling on Abyei which gave the oil wells to his tribe. He added that his tribe does not care about oil as much as it cares about land, water, and grazing grounds for the huge cattle his tribesman own. He pointed out that "oil does not mean anything to us and cannot be a substitute for the grazing grounds, water, and lands that our brothers in the Dinka Ngok have acquired" under the ruling. Al-Misiriyah tribe is demanding that all the lands north of "Bahr al-Arab" should be their areas, including the town of Abyei, the province's capital, and are saying that the Dinka Ngok tribe's lands are south of Bahr al-Arab. But The Hague's decision granted this area to the African tribe. Hamdan said: "Our tribe will not take part in the demarcation of the boundaries because the National Congress leaders in Khartoum rendered an injustice to the tribe twice, the first when it fought a war with them against the People's Movement [SPLM] and the second after the National Congress got the oil wells" and he threatened to head south to join the SPLM. He pointed out that Al-Misiriyah tribe was looking for ownership of the land of Abyei "but we have been removed from it and it was handed over to the Dinka Ngok tribe." Al-Huraykah Izzaldin, one of the most prominent emirs of Al-Misiriyah said "the tribunal made its decision and we are complying with it" while Sultan Majok Fajwak from Dinka Ngok underlined the tribe's desire for coexistence and said "there will no disputes with Al-Misiriyah." A high ranking leader in the Arab Al-Misiriyah tribe in the contested Abyei area between north and south in Sudan has announced his rejection of the ruling the International Arbitration Court [IAC] in The Hague issued the day before yesterday which re-demarcated the area. He considered it "unfair" to his tribe and called the National Congress (the ruling party led by President Omar al-Bashir) opportunistic and panting after the oil in the Hajlij area which might see another conflict when the boundaries between north and south are demarcated since the southerners are claiming it is part of Al-Wihdah Province in Upper Nile, south Sudan, and not the north. Hamdan Ahmad Ali, who identified himself as the "emir of the mujahidin in Al-Misiriyah tribe", said in a telephone interview with "Asharq Al-Awsat" from the Abyei area that the majority of his tribe which is of Arab origins rejects the IAC ruling on Abyei which gave the oil wells to his tribe. He added that "his tribe does not care about oil as much as it cares about land, water, and grazing grounds" for the huge cattle his tribesman own. He pointed out that "oil does not mean anything to us and cannot be a substitute for the grazing grounds, water, and lands that our brothers in the Dinka Ngok have acquired" under the ruling. Al-Misiriyah tribe is demanding that all the lands north of "Bahr al-Arab" should be their areas, including the town of Abyei, the province's capital, and are saying that the Dinka Ngok tribe's lands are south of Bahr al-Arab. But The Hague's decision granted this area to the African tribe. Hamdan said: "Our tribe will not take part in the demarcation of the boundaries because the National Congress leaders in Khartoum rendered an injustice to the tribe twice, the first when it fought a war with them against the People's Movement [SPLM] and the second after the National Congress got the oil wells" and he threatened to head south to join the SPLM. He went on to say that his tribe entered into an alliance with the National Congress throughout the civil war of more than 20 years against the southerners and it became clear to it that it had wasted its sons' blood and added: "The National Congress is now in an alliance with oil against our interests." He pointed out that Al-Misiriyah tribe was looking for ownership of the land of Abyei "but we have been removed from it and it was handed over to the Dinka Ngok tribe." After refusing to have his tribe take up arms again against any group, whether the central government or the south, he said: "We will act freely and according to what we want. We will not take up arms against the National Congress or the SPLM but will announce we are joining the south because our benefits are there and let the oil benefit the National Congress government." He added: "We will not die again in defense of others and will live with our kinsmen the Dinka Ngok to whom we are historically bound. We have learned now more from Khartoum's deceptions than at any time before." Other leaders in Al-Misiriyah and Dinka Ngok tribes, the two largest ones in the Abyei area, welcomed the demarcation decision and announced their compliance with it before underlining the "peaceful existence" between them. On the part of Al-Misiriyah tribe, Mukhtar Babu Ahmad, the tribe's administrator, underlined his tribe's compliance with the decision with reservations and said his tribesmen wished "there were no boundaries" and urged his counterparts in Dinka Ngok not to abandon the fraternity with Al-Misiriyah and told them: "If you win a land, do not lose the brothers." He added "you are with us and earth is not important." Al-Huraykah Izzaldin, one of the most prominent emirs of Al-Misiriyah said "the tribunal made its decision and we are complying with it" while Sultan Majok Fajwak from Dinka Ngok underlined the tribe's desire for coexistence and said "there will no disputes with Al-Misiriyah." The GOSS-SPLA ought to & must move faster to assure the Messeiria Tribes that their cows grazing rights will be more than protected and welcome deep into the South after secetion-separation of the country after 2011. Since meterologists predicted and documented that the desert is expanding Southwards of Sahara, GOSS has a golden chance to win corporation of the Messeiria Tribes. We must move faster to befreind and win the Messieria to our side during secetion in 2011. If we don't move faster, the NCP might cook up some tricks to book the Messiria and turn them into ruthless jihadi militias in the future! - Dr Bullfrog, 24 July 2009. The Misseriya live a cyclical life that takes them on an annual journey to the sourth as the dry season approaches before returning north as the rains return. The Muglad to Abyei corridor is one of the three migratory routes that pass through the Abyei area. From July through October the community lives in Al Jabra near Muglad and then makes the two month journey sout the Goles, about 25 km north of Abyei town, with their familites and caltle. When the rains return in May the Misseriya move north along the same route arriving in the Muglad area two months later. The dry season is often a period of heightened tensions and conflicts between the host and migratory communities over water points and grazing lands. In recent times, the traditional mechanisms for resolving their conflicts amicably have been complicated by competing interest groups. Source: Tim McKulka/UN 01.21.09 Produced by PIO-UNMIS. Click on Abyei label here below for related reports and updates.